The goal of mv2m is to simplify JVM testing of an Android application. 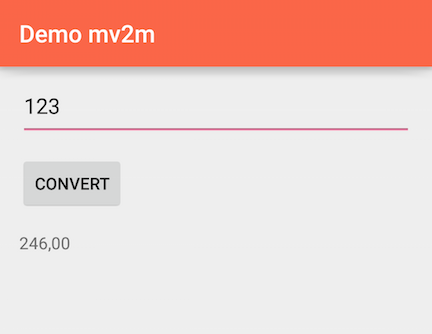 The demo module contains a simple example of usage of mv2m library. The official app of the Italian blog cosenonjaviste.it is a more complex example (built using Dagger and RxJava). This repository contains the mv2m porting of android-testing codelab repository. A Model class contains the data used to populate the user interface using Data Binding library. It's saved automatically in Actvity/Fragment state, for this reason it must implement Parcelable interface. The View is an Activity or a Fragment, the user interface is managed using Android Data Binding. You need to extend ViewModelActivity or ViewModelFragment class and implement createViewModel method returning a new ViewModel object. The ViewModel is a subclass of ViewModel class, it is automatically saved in a retained fragment to avoid the creation of a new object on every configuration change. 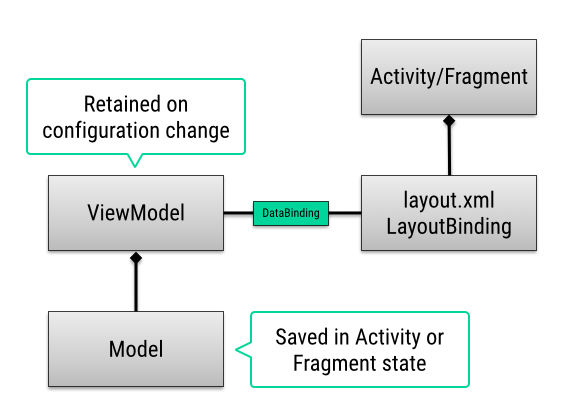 The ViewModel is usually the object bound to the layout using the Data Binding framework. It manages the background tasks and all the business logic of the application. The ViewModel is not connected to the View, for this reason it's easily testable using a JVM test. The demo module contains some JUnit tests for ViewModel classes. An implementation of this class can be referenced from a ViewModel object. ViewModel class contains a protected ActivityHolder field containing a reference to the current Activity that can be used as parameter (it's automatically updated every configuration change). In this way it's easy to show a SnackBar from a ViewModel. In a JVM test SnackbarMessageManager object can be mocked to avoid dependencies on Android framework. ViewModel class contains a protected field argument that can be used to load the model data based on the argument. In case you use Fragments as View objects you can use ArgumentManager.instantiateFragment method to create a new Fragment and set the argument on it. This library (and the Android Data Binding library) is still a beta version; feedbacks, bug reports and pull requests are welcome! Let's see how to use mv2m to implement a simple example: a currency converter Activity. All the business logic is in the CurrencyConverterViewModel class, it extends ViewModel class defining two generic parameters: Void (we don't need any argument) and the Model class. We use the dependency injection on the constructor to manage a reference to a RateLoader object. The createModel method is overridden to create and return a new Model object. In this JUnit test we use Mockito to create a mock of RateLoader object, in this way the test is repeatable because it's not dependent on external sources. The app:binding and app:onClick are custom attributes, this post explains how to create them. In a real example the RateLoader execute an HTTP request to get the rate, we need to manage threads in the right way. The ViewModel can manage the concurrency in various way, in this example we don't use AsyncTasks or Intent Services because we want to test it using a JVM test. The loading field is an ObservableBoolean and can be used to show a loading indicator, it's saved in ViewModel (and not in Model) to avoid errors when the application is killed while the task is running. RxJava support is available in mv2mrx module, it contains RxViewModel class that can be used to manage RxJava Observable. The subscribe method is defined in RxViewModel class, it manages the RxJava Observable connecting it to the Activity lifecycle: it is paused and resumed (using a replay hot observable) when the Activity is paused and resumed and destroyed when the Activity is "really" destroyed (not on a configuration change).